The example plot shown here is from a merged RWP-WACR-ARSCL data set. 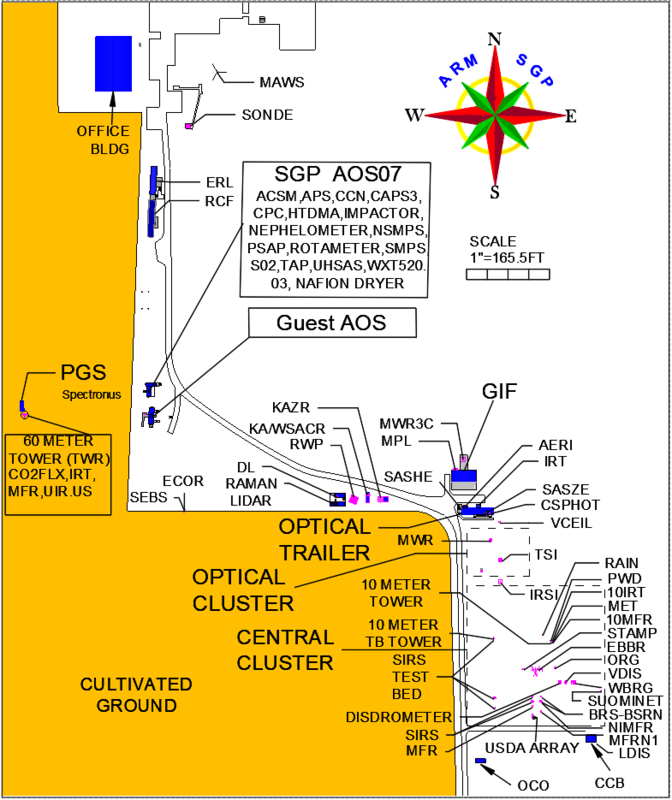 Key: a) WACR reflectivity; b) RWP reflectivity; c) new RWP-WACR-ARSCL cloud mask; d) cloud-type classification; e) microwave radiometer (MWR) retrieved liquid water path (blue), present weather detector (PWD) rain rate (black), and tipping bucket rain rate (red). The black dots in panels (a, b) reflect a best estimate cloud-base height and ceilometer cloud-base height from the WACR-ARSCL data set. Magenta bars above panel (d) show periods when RWP data were used to replace WACR data (green bars). The second colorbar to the right of panel (a) shows a quality flag of the merged data. A newly available ARM principal investigator product can be used by scientists to better characterize cloud and precipitation profiles of all conditions, including during heavy precipitation from storms, as well as validate model simulations. The Merged RWP-WACR-ARSCL Cloud Mask and Cloud Type data for the GoAmazon2014/15 field campaign has been released for the year 2014 to 2015. It includes cloud type, cloud top height, radar reflectivity, vertical velocity, and atmospheric states for all conditions. The merged data set provides an improved depiction of all cloud types — in particular, better characterization of shallow, congestus, and deep convective clouds compared to the standard WACR-ARSCL VAP. Scientists can begin using the merged data set now. The merged data product contains all available records from the GoAmazon2014/15 field campaign. To share your experience or to ask questions, contact Zhe Feng or Scott Giangrande, the principal investigators who shared these data. Users can access the data set from the ARM Data Archive. (Go here to create an account and download the data.) To cite this data set, please use doi: 10.5439/1462693.